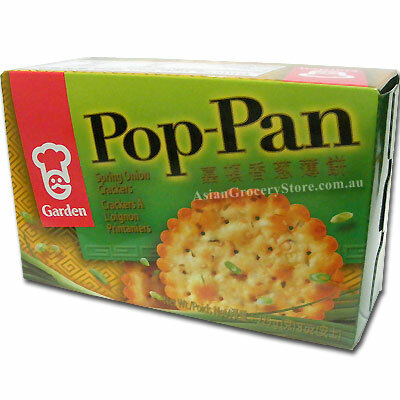 Minimum quantity for "Garden Pop-Pan Spring Onion Cracker" is 1. Wheat Flour, Vegetable Oil(palm oil and coconut oil)(contains antioxidant 9ascorbyl palmitate(E3040, di-a-tocopherol(E307), Soy Lecithin(E322))), Sesame, Spring Onion, Salt, Sugar, Skimmed Milk Powder, Glucose Syrup, Antioxidant(ascorbyl palmitate(E304), di-a-tocopherol9E307), Soy Lecithin(E322)). Allergy Advice: This product may contain traces of egg and peanut.